[German]Today, March 13, 2019, is patchday. Adobe is releasing a (security) update for its Flash player, which raises the version to 29.0.0.0.113. The update should be rolled out within the next few hours. Adobe Security Bulletin APSB18-05 has been released and mentions that the update closes critical vulnerabilities. The Release Notes doesn’t reveal more details, but the following Adobe Flash versions are affected by security issues. So Adobe releases Flash Player 29.0.0.113 for Windows, Macintosh, Linux and Chrome OS to close vulnerabilities. If you have activated the auto-update function of the Flash-Player and installed the player separately, you should receive this update automatically. Security Bulletin APSB18-05 contains download links for the new version. For Windows 8.1 and Windows 10, Microsoft will roll it out later today via Windows Update. Direct download links for the update are already mentioned here (but I haven’t checked for accuracy). The Chrome Browser should automatically pull the update. You can also manually check for updates by typing chrome://components into the address bar. Then you will find the entries show in the screenshot above. There is also a button to search for Flash updates. Currently my browsers doesn’t find the new update. Which Flash Player version do I have? The installed Flash version can be queried on this Adobe web site. 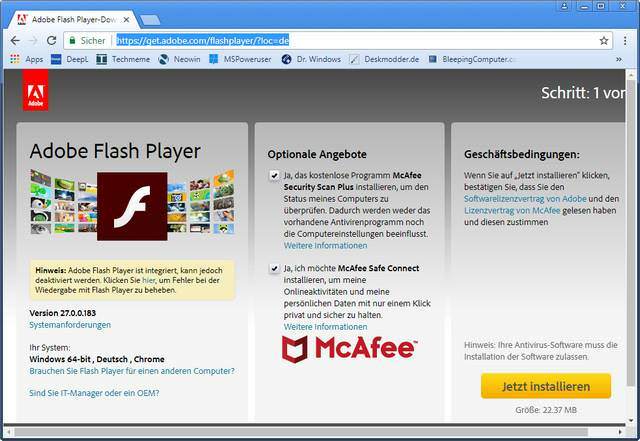 There you can see if the Flash-Player is supported in the browser, which version is used and which version is available for the update at Adobe. If you update the Flash Player via the above Adobe page, make sure that the PUPs offered (McAfee Security Scan Plus and True Key from Intel) are not installed with the software. As in the previous month, a final warning. I’m sure that some users will use a search engine of their choice to look for Flash Player updates. Don’t download a Flash Player update from third party sites, because some sites offering ‘updates’ with malicious addons (see Beware of fake flash player updates). Visit this Adobe page and check in the upper right corner the entry Last Published to make sure, the March 2018 update has been released. The scroll down to section ‘Still having problems?’ – there are direct download links for Flash player. 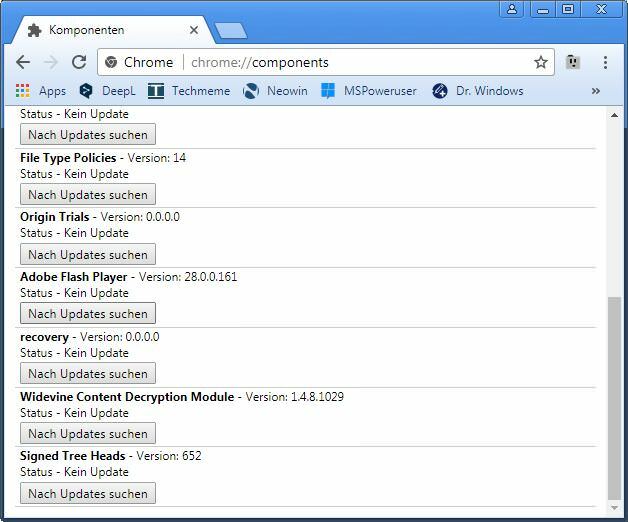 How to update Flash Player in Chrome or Slimjet? This entry was posted in Security, Update and tagged Adobe Flash, Security, Update. Bookmark the permalink.